Invested capital turns are an important consideration in the analysis of return on invested capital (ROIC). This metric measures a company’s operating revenues relative to its average invested capital. It is the multiplier through which a company’s NOPAT margin (or core operational efficiency) is translated into its ROIC, which also accounts for the cost of the balance sheet. In other words, it is a key measure of balance sheet efficiency. We’ve previously demonstrated that ROIC is the primary driver of stock prices. Invested capital turns can also provide insights into the capital intensiveness of a business and whether it has deployed capital prudently over time. Since the market assigns value to companies that produce the most cash per capital invested, knowing which companies have deployed invested capital most efficiently is an important factor in the investment decision-making process. The formula (see Figure 1) for calculating invested capital turns is straightforward. The hard part is finding all the data, especially from the footnotes and MD&A, required to get invested capital right. When we calculate invested capital turns, we make numerous adjustments to close accounting loopholes and ensure apples-to-apples comparability across thousands of companies. Figure 2 below shows why invested capital turns matter. The higher a company’s ratio of invested capital turns, the lower the required NOPAT margin to earn an adequate ROIC. Conversely, the lower a company’s ratio of invested capital turns, the higher the required NOPAT margin to earn an adequate ROIC. General takeaways from this relationship include: 1) naturally lower-margin businesses need to be capital efficient; 2) naturally more capital-intensive businesses need to be margin efficient; and 3) high-margin, capital-light business models are capable of generating exceptionally high ROICs. Figure 3 shows the companies with the highest and lowest invested capital turns within our U.S. 500 coverage. 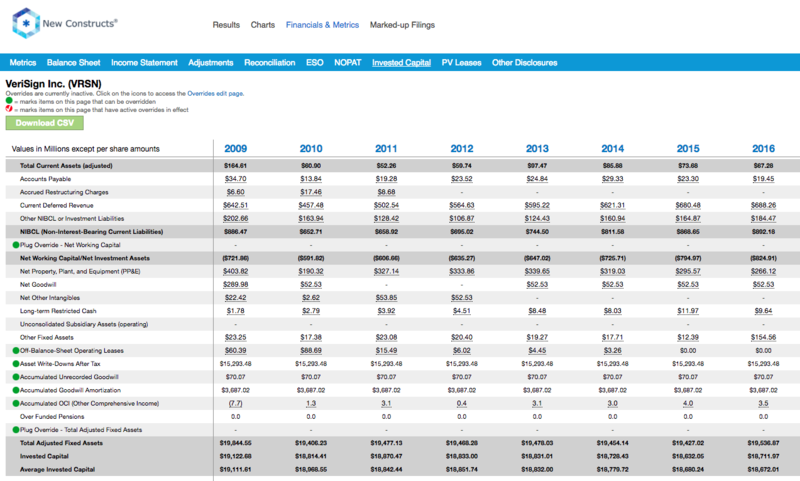 AmerisourceBergen Corp’s (ABC) invested capital turns of 16.0 is the highest of all U.S. 500 companies under coverage. This ratio of invested capital turns means ABC’s revenue base is 16x larger than its invested capital base. 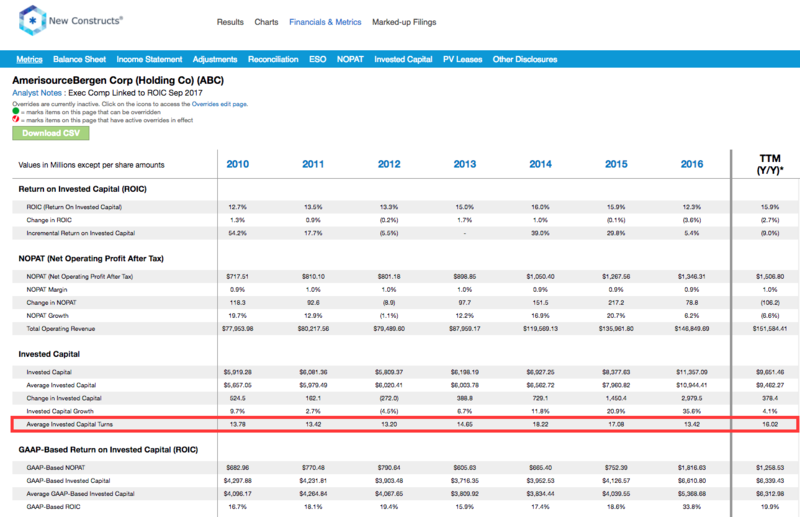 It also means ABC earns a top-quintile 16% ROIC on a NOPAT margin of just 1%. See a historical view of ABC’s invested capital turns here. Apple (AAPL), Costco (COST), Fluor (FLR) and C.H. Robinson Worldwide (CHRW) have the second through fifth highest ratio of invested capital turns. A high ratio of invested capital turns alone doesn’t make for a good investment. However, it is telling that there are three Attractive-or-better rated stocks among the five companies with the highest invested capital turns and none among the companies with the lowest invested capital turns. 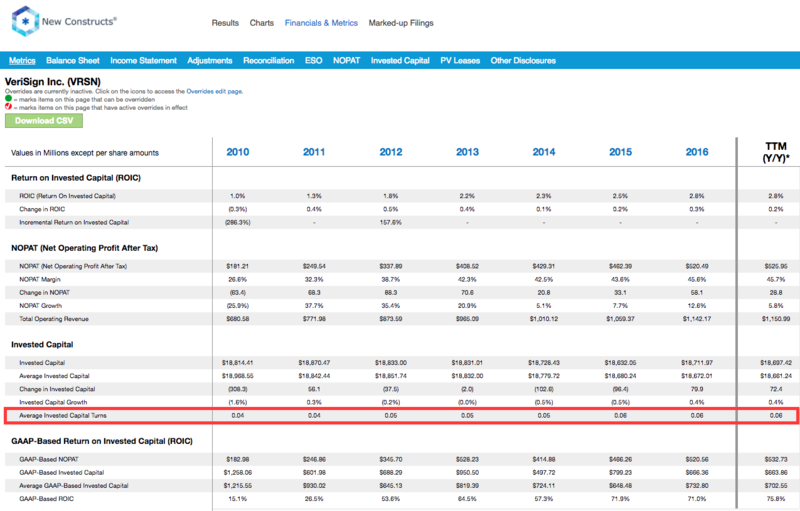 VeriSign’s (VRSN) invested capital turns of 0.1 is the lowest among all U.S. 500 companies under coverage. This ratio of invested capital turns means VRSN’s revenue base is 1/10 the size of its invested capital base. It also means that VRSN earn a bottom-quintile 3% ROIC despite a NOPAT margin of 46%. See a historical view of VRSN’s invested capital turns here and invested capital adjustments here. Prologis (PLD), Realty Income (O), SL Green Realty (SLG), and Regency Centers (REG) have the second through fifth lowest ratio of invested capital turns. Notably, all four of these companies are REITs, which reflects the heavy capital investment involved in the acquisition and management of numerous real estate properties. We make it easy for the average investor to leverage the benefits of a high quality ROIC model. Our models and calculations are 100% transparent because we want our clients to know how much work we do to ensure we give them the best earnings quality and valuation models in the business. As our research continues to proliferate, it gets harder for investors and executives to overlook its merits.